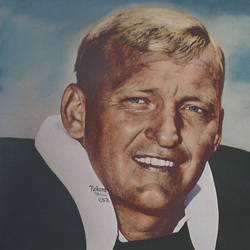 The last remaining original Raider, Jim continued his consecutive streak of not only playing in, but starting 210 straight league games an all-time pro record he shares with teammate George Blanda. Jim was All-League center for each AFL year and was chosen on the Hall of Fame's AFL All-Star Team of the decade. Jim has missed only minutes of playing time in 15 seasons. Was All-State center and linebacker at Miami.